Anki has released something new to the market – a Cozmo miniature robot. As the creators say, they tried to do something that would be felt as part of the family. The statement is undoubtedly loud, but Cozmo really evokes positive emotions and at the same time resembles a pet and a cartoon robot WALLE. A miniature tracked robot looks more like a small toy tractor. The central linkage works instead of hands, so Cozmo can move, knock down objects in its path. On the digital face-screen, Cozmo has eye animation, with which he expresses a huge range of emotions embedded in him. In Cozmo also incorporated voice, expressed by sound signals, audio recordings. + Cozmo works out of the box, but this is just the beginning + The more you play with him, the more his skills and abilities develop! + Play with him and each time unlock all new and new game modes and behaviors. 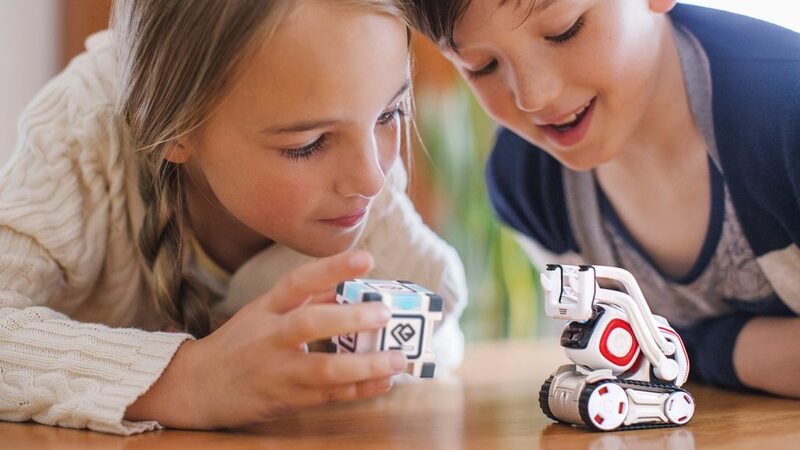 First look at the toy robot Anki Cozmo: the best pet? Cozmo is a real person. Funny little robot has already been in our hands. The little robot knows your name and recognizes your face. He will tell you when he needs maintenance. He has three cubes that he likes to fold, knock and play. He will also tell you when he gets bored and wants to play the game. When he wins, he will dance. 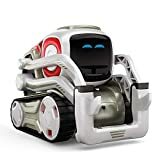 Cozmo is a new robot, a small smart toy from Anki from San Francisco, California. And although in this case, this creature, obviously, is only a gadget, during the first acquaintance it demonstrated surprisingly emotional intelligence. Of course, this is far from IBM Watson or Google DeepMind, but still it is artificial intelligence, which is now available to the end user. Before we proceed to the further study of software, let us take a look at the hardware stuffing Cozmo. As we managed to find out during a visit to the manufacturer’s headquarters, it took about five years before the robot could find its final shape. Cozmo took a lot of different looks and at times looked like a Lego Technik-style robot, before the choice fell on its current compact form. The toy consists of 360 parts, and the most important, perhaps, is the WLAN receiver and camera. 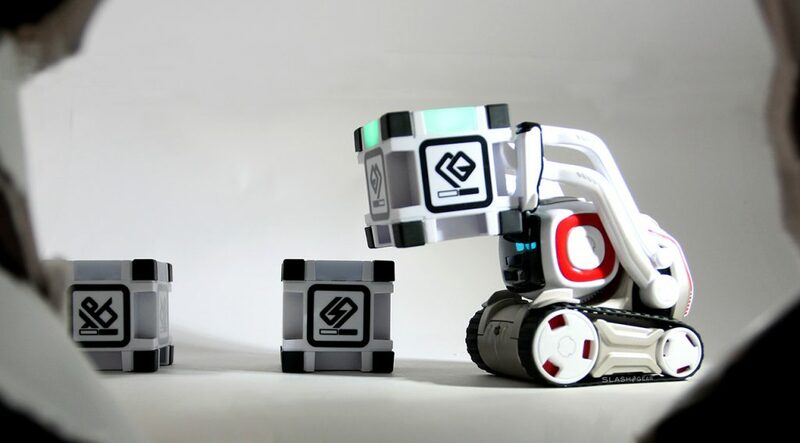 Through the wireless Internet, the robot communicates with your smartphone and with its cubes. The camera installed in his head recognizes the surroundings with a resolution of 640×480 pixels. “Terribly, his eyes are in his mouth,” the computer vision engineer Andrew Stein explains to us at a demonstration in San Francisco and indicates the location of the camera. Indeed, it is located under the eyes of Cozmo, that is, where, strictly speaking, there must be a mouth. The camera shoots the surroundings of Cozmo at 15 frames per second and records everything the robot sees. Thus, he can navigate in space and knows, for example, where people and cubes are located around him. About one and a half hours the robot can play with you before you get completely tired. “It will be tired,” of course – it’s about the dead battery. But Cozmo reacts to the depletion of energy reserves so humanely that we perceive it almost in just this way. 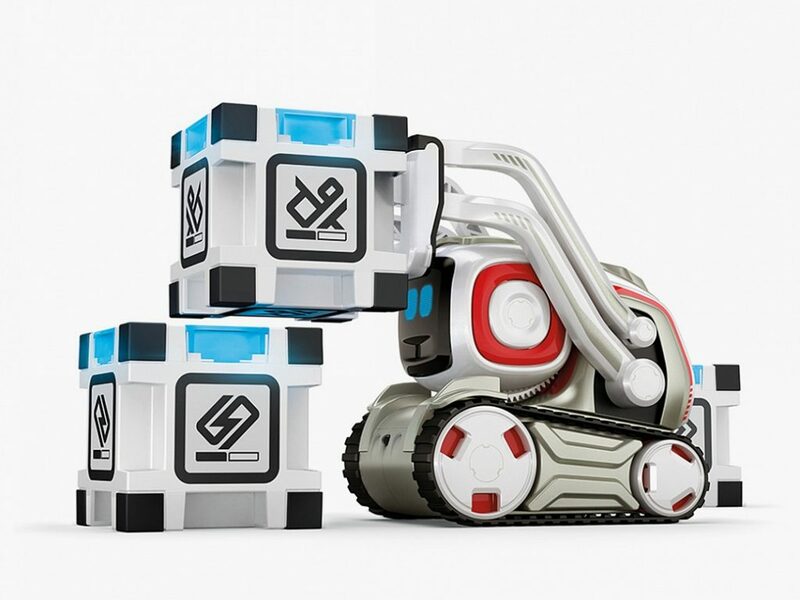 However, without the software, Cozmo would have remained just a plastic box. More than 1.4 million lines of code in the C, C ++ and Phython programming languages breathe life into the robot. They combine with about 900 animations and 2500 audio files that allow Cozmo to show its emotions to people. Mostly they are joyful: Cozmo is programmed to be a happy robot and only for a short time to experience such negative emotions as anger, frustration and sadness. In addition, it is optimized to constantly learn and develop emotionally. Already, the face recognition program integrated into the robot allows it to memorize specific people and access them accordingly if he recognizes them. Persons and names are stored in a special application. Here are, however, other interactive “parts” of the robot personality: Cozmo phonograms. From audio engineers, he received his “title” song, which is played by the application and varies with the help of “loops” for more than 42 minutes. Depending on the mood and activity of Cozmo, the music may acquire a kind and cheerful sound, or it may become more intense and dramatic. According to the president of Anki, Hans Tappeiner, despite the presence of a camera in the head of a robot, he will not become a spy in the children’s room. Cozmo software does not work on the server online. The interaction is carried out only with the application on your smartphone, so the robot and the application form a closed eco-system. Cozmo can only be hacked if someone succeeds in successfully attacking your home WLAN network. Robot Anki Cozmo, despite its small size, the mechanism is quite complicated. It consists of more than three hundred components, and more precisely 340. Moreover, the complexity of the various. And they work on data coming from the sensors and making the most complicated calculations. The electronic system Cozmo includes sensors, speakers, ARM processors (3 pcs. ), Helping to recognize obstacles and navigate in space. High-speed embedded processor processes hundreds of signals per second, calling for help smartphone processor to solve the most complex tasks. Cozmo eyes that change expressions, depending on the raging emotions, have a blue robot. To understand the environment, it has a camera. The little robot has a character to be reckoned with. 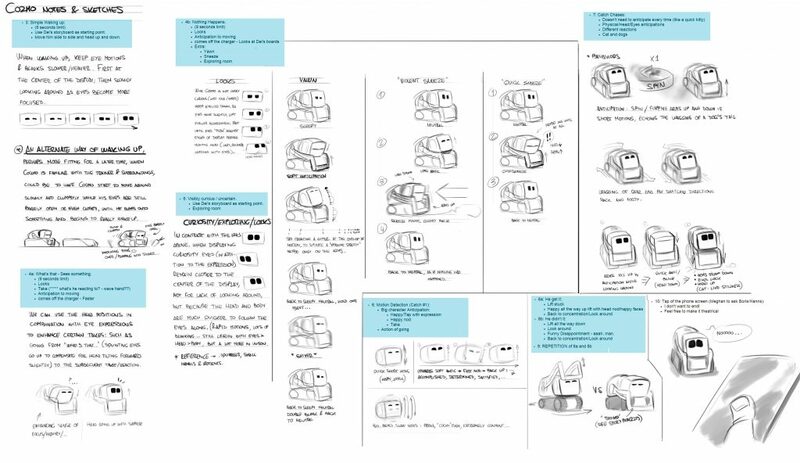 Externally, Cozmo is very similar to the cartoon characters of the animation company Pixar, and this is understandable: the Wall-E hero inspired the authors to create the look of Cozmo, while the animator who previously worked at Pixar worked on it. His appearance is so cute that children will certainly like it. The size of a charming toy is commensurate with two matchboxes, i.e. the robot will easily fit even on the palm of a child. In addition to the tracked chassis, it has a rounded body, a square head with a small face-display, and extended arms. It seems nothing unusual, but the intellectual toy amazes with its abilities, behavior, ability to assimilate information. Robot with a character behaves like an animated hero descended from the screen and at the same time a cute little tractor, because, like him, the toy has a crawler course. The manipulator plays the role of hands that can grip, hold (even a person’s finger) and move objects. Thanks to him, the toy resembles a bulldozer. Robot is a symbiosis of knowledge accumulated in robotics, artificial intelligence, mechanical engineering, programming, and more. And also, little Cozmo sleeps and snores like a real person during a vacation. He is even able to answer questions! Cozmo can be managed from a smartphone and Android and iOS applications. Battery charging in just 10 minutes. Provide a two-hour opportunity to communicate with the robot. When the battery of the robot is again close to the critical charge, this will alert the beep. In the early days, Cozmo is very shy when meeting people. Then, playfulness is noticeable in the behavior. If he is busy building a tower of cubes supplied in the kit, and you are disturbing him, it is clearly noticeable how the robot is angry. It is extraordinarily believable, so the kids doubt this toy or something alive. Managing Cozmo, the world appears before his eyes, and this is something new, causing unusual feelings.